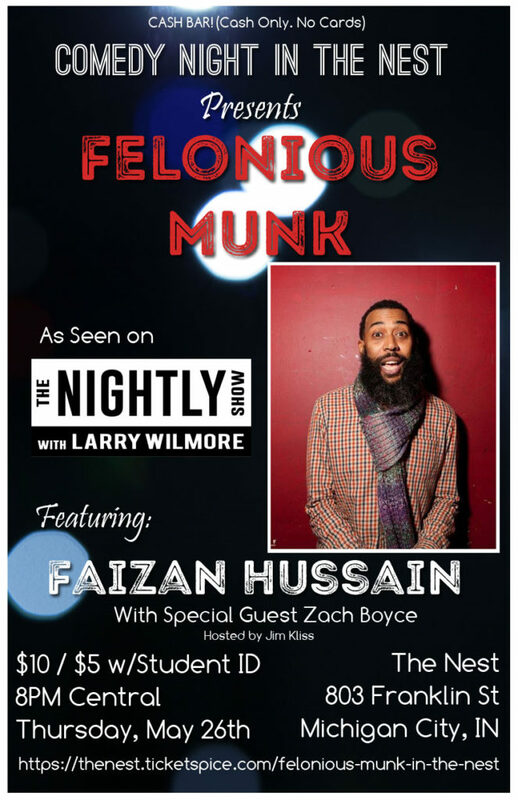 Comedy Night in The Nest is proud to present Felonious Munk for ONE NIGHT ONLY in The Nest Michigan City, featuring Faizan Hussain, with special guest Zach Boyce! Tickets are $10 or $5 with a valid student ID. Showtime is at 8pm Central, doors open at 7:30. Cash Bar! We’ll have a selection of beer and wine available for your drinking pleasure! Cash only, please, No Cards. 8PM Central, doors at 7:30 PM. Munk first gained notice for his viral YouTube series “Stop It B” while performing stand up in the back of a Jamaican restaurants. His sharp political satire earned him an opportunity to do comic news commentary for New York’s WPIX11, syndicated news network Touchvision TV, and eventually as a contributor for The Nightly Show w/ Larry Wilmore on Comedy Central. His stand up mixes topical material with his unique take on everything from masculinity and age, to parenting with a smartphone. He can be seen all over the country and in some of New York’s top clubs including the Stand and the newly renovated New York Comedy Club. We’re back! 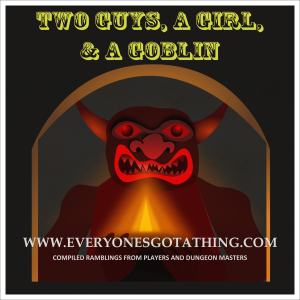 Season 3 is here, and we’re playing a new edition of D&D! 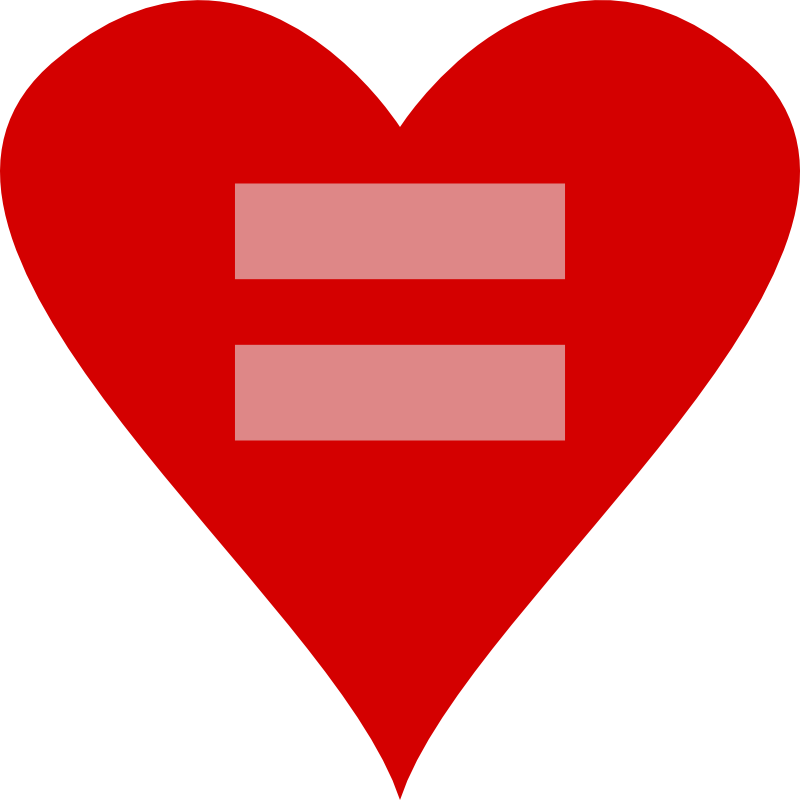 Change is hard, but I think we’re making it through without too much trouble. For this season, we’re playing “The Lost Mines of Phandelver” a boxed adventure available as part of the D&D 5th Edition Starter Set. The starter set comes with everything you need to play D&D, and I think the adventure that comes with it is a good intro to the new system. We also added a new member of the podcast family, Derek Krentz, who is an old friend of Aaron’s. I look forward to torturing him as much as I’ve tortured all the rest of the crew! There’s lots of exciting stuff this season, and we’re looking forward to the new system, and a whole new custom campaign, “The Devil’s Due” on the horizon for season 4. The Book Club analyzes and explores the 7th volume of the Neon Genesis Evangelion manga by Sadamoto. One of the biggest points being the introduction of Kaworu to the cast. 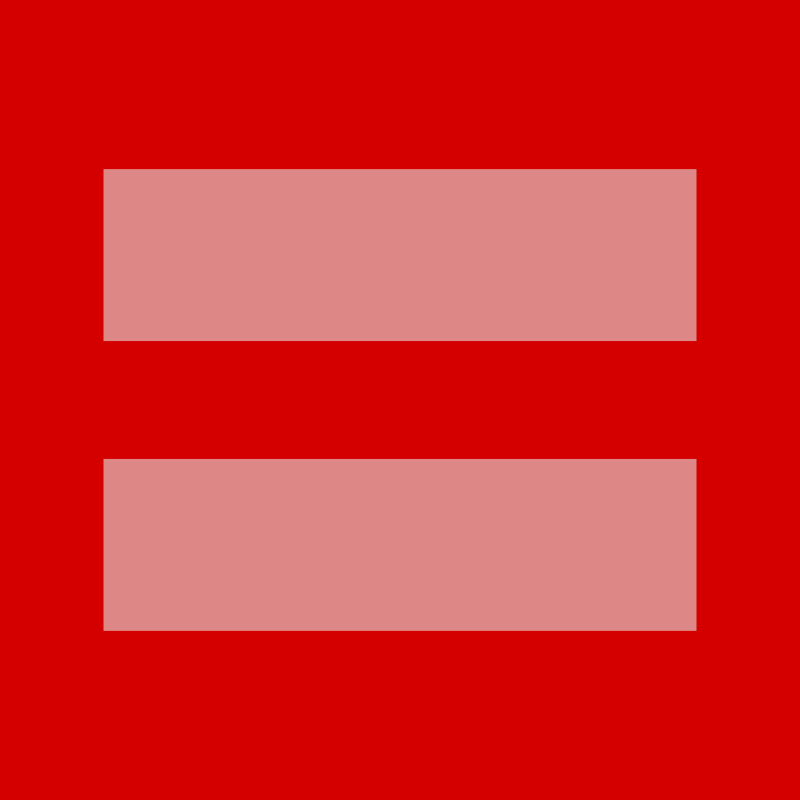 Subscribe to us on iTunes and YouTube! The Book Club talks about the 5th installment of the manga and comes to some shocking realizations about what might be in Misato’s past. In this week’s episode, we continue our conversation with Aaron’s lady friend, Theresa Slabosz, to talk about all things Disney. Theresa LOVES Disney stuff, and spent 6 months as an intern at the Florida parks. We talk about movies, the parks, the TV shows, and yes, a certain frozen head. This is part two of a two part episode. You can find Theresa on Twitter at @theresaslabosz.